We are near the equator where days the year around are about the same length. Light comes at 6 a.m., darkness at 6 p.m. The traditional Tanzanian clock reflected that, with one o’clock being one hour after sunrise. However you measure it, we have filled our time with as much adventure and discovery as we possibly can. 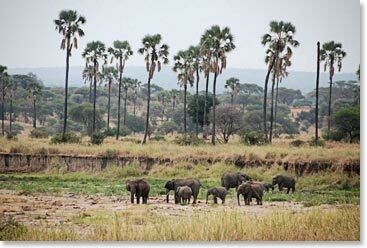 This morning we made our way back across Tarangire National Park. We saw more elephants, zebras, wildebeests, and a couple of lions, then drove to nearby Lake Manyara National Park for a look at the hippos. It was a cool day and the huge animals were piled up ashore, sleeping through the morning. Our route took us up the escarpment of the Great Rift Valley, a slippage of tectonic plates long ago that created the Rift Valley across much of Africa. We had lunch at the Serena Lodge atop the uplift, with great views out toward the valley. From there we motored up the steep slopes of what was once a massive volcano before collapsing in on itself to become the caldera of the Ngorongoro Nature Reserve. 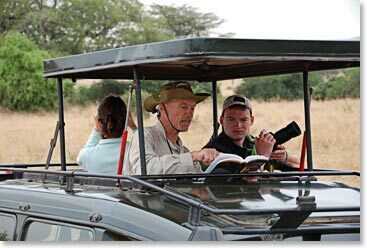 The day had turned cool and misty, and we looked down on a landscape that from the crater rim seemed almost prehistoric. 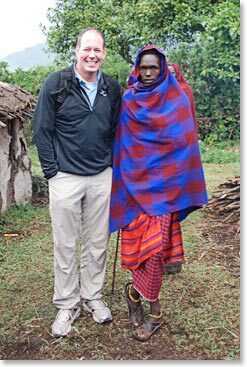 Before arriving at our lodge, we spent a very enjoyable hour at a Maasai village, visiting with several young men who guided us around their home. We sat inside the huts and talked about Maasai life. Alex Nye matched the Maasai dancing with a standing backflip, and John Privitera presented the village with a soccer ball that is sure to get used until the cover is worn away and there’s nothing left to kick but the air inside. The Sopa Lodge overlooking Ngorongoro is the perfect setting for us to relax and prepare for a very early morning departure to drive down amidst the wildlife on the crater floor. We’re planning on a box breakfast so that we can leave the lodge at exactly sunrise. That would be 6 a.m. for most of us, but one o’clock for those still following the Tanzanian ways of telling time. Pete and Alex Nye study birds. 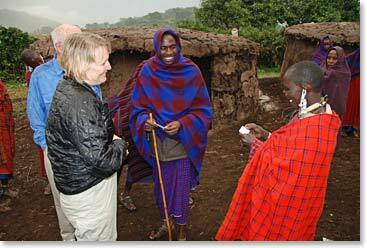 Jane Lynch gives her card to a Maasai woman.